No matter your past, don't ever forget that your Father in Heaven is in the business of transforming lives! He sent His Son, Jesus to died for your sins and if you are in Christ, you've been set apart by Him (Sanctified) and as you walk with Him in faith, salvation in Him has made you a new creation and He's daily working to renew your mind so you can be even more useful to Him! Take time right now to thank Him for His transforming power in your life! Heavenly Father, Thank you for Your transforming power! 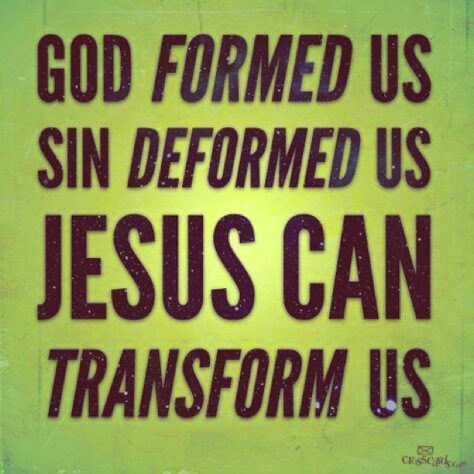 You take unworthy sinners and forgive & transform us. You've made us new creations & You are daily renewing our minds. You've satisfied / set us apart & You are daily progressively sanctifying us to be useful vessels for You! Again, I thank You and Praise You in Jesus name I pray, Amen!